The University of Arizona appears in our ranking of the 5 Best Online Schools for a Bachelor’s Degree in Entertainment Management. The University of Arizona offers a General Education undergraduate degree with an emphasis on arts, media, and entertainment. The program is designed to help students understand how to criticize and evaluate art forms. They are also provided knowledge in the process by which art and creativity are communicated and academic knowledge of promoting the performing arts. Students are able to demonstrate an awareness of roles that arts, entertainment, amusement, recreation, and media play in today’s world as well as how they have impacted life historically. They are able to identify contributions by various artists and exhibit an understanding of how art, media, and entertainment shape cultural priorities regionally, nationally and internationally. The program is available in both a traditional and online format. Students may also choose a hybrid format, taking some classes online and some on campus. The University of Arizona also offers a Bachelor of Fine Arts with an emphasis in art and visual culture education. The program provides students with the theoretical foundations of art and allows them to interact with practitioners through field experiences, observations, student teaching, and internships. Students may choose to concentrate their studies in Community & Museums or Teaching Certification. The program includes general education courses along with studio and art history, art education, education, and a student teaching practicum. Courses may include studio, history, theory, issues of diversity, social justice and the practice of art and visual culture education. 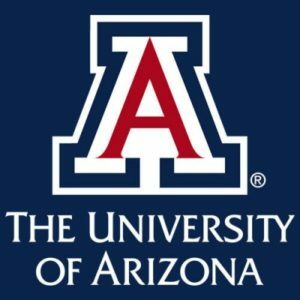 Undergraduate students at the University of Arizona may apply for an accelerated master’s degree in Art & Visual Culture Education. The program allows current students to use 12 units of graduate coursework towards both their undergraduate and graduate degree. This allows them to receive both degrees in five years. Students may emphasize their studies in Art & Visual Culture Studies, Community & Museums or Teaching Certification. Students must complete 30 credits for the master’s degree along with certification coursework if they choose the teaching certification track. The passage of the Morrill Land Grant Act of 1862 led to a major push for a university in the Arizona Territory. The Arizona Territorial Legislature was charged with the task of establishing a mental hospital, a normal school, and a university with bitter battles between Tucson, Tempe, Phoenix, and Prescott for those three establishments as well as the designation as the state capital. The battle for the mental hospital was fierce as it brought a $100,000 allocation as opposed to the $25,000 allotted for the University. When the dust settled, the capital remained in Prescott, Phoenix was awarded the mental institution, Tempe the normal school and Tucson the university. Many residents of Tucson were unhappy with the decision and the new school struggled to find land to be donated for its location. Eventually, two gamblers and a saloon keeper donated the land and the first building on the new campus opened in 1887. The first graduating class consisted of two women and one man. Today, there are more than 44,800 students enrolled at the University of Arizona. The school offers 130 undergraduate degrees as well as 143 master’s, 93 doctorate and 3 specialist degrees. US News & World Report ranks the school in the top 50 public universities and in the top 30 for online bachelor’s degrees. Fiske Guide has named the school a Best Buy and Princeton Review lists it as a Best Value. The National Science Foundation ranks the school 25th among public research institutions and 92 percent of employers say that graduates have the skills to succeed. Applicants who have not earned college credit after graduating from high school must complete an application and provide official high school transcripts. They must also provide official SAT or ACT scores. Applicants who have earned 12 or more credits after graduating from high school must provide official transcripts from all colleges and universities attended. Any applicant who is under the age of 22 regardless of transfer credits must provide official high school transcripts. In order to apply for graduate programs, applicants must hold a bachelor’s degree or higher from an accredited college or university. They must have a minimum GPA of 3.0 and transcripts from all colleges or universities attended must be provided. Tuition for undergraduate students who are Arizona residents is $11,400 and for non-residents $32,800. Tuition for graduate students who are Arizona residents is $12,000 and for non-residents $30,400. Online tuition ranges from $490 to $515 per credit hour for both resident and non-resident students. Cost of tuition varies between programs so students are encouraged to discuss specific costs with an admissions counselor. Financial aid is available and 85 percent of students receive some type of financial assistance. Students can receive Wildcat Tuition Awards of up to $15,000 and Arizona Tuition awards of up to $35,000. National Scholar Tuition Awards are also available. Students may be offered grants as well as scholarships. Work-study programs for on-campus students which provide employment to offset tuition may be provided. Loans may be included in a financial aid packet but it is important to remember that they must be repaid. All students, regardless of income, should complete the Free Application for Federal Student Aid (FAFSA) in order to qualify. The University of Arizona has been providing an outstanding education for over 150 years. Students are prepared for leadership roles in their chosen field of study through rigorous academics at the University of Arizona.